A snapshot of the United States in 2065 would show a nation that has 117 million more people than today, with no racial or ethnic majority group taking the place of today’s white majority, according to new Pew Research Center projections. About one-in-three Americans would be an immigrant or have immigrant parents, compared with one-in-four today. These projections show that new immigrants and their descendants will drive most U.S. population growth in the coming 50 years, as they have for the past half-century. 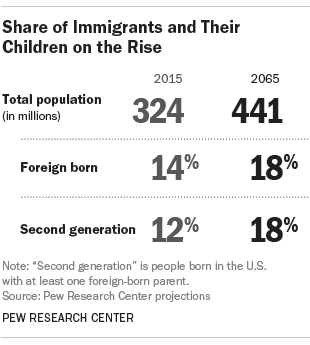 Among the projected 441 million Americans in 2065, 78 million will be immigrants and 81 million will be people born in the U.S. to immigrant parents. The projected changes in population makeup could have implications in a variety of realms, changing the face of the electorate, raising the education levels among the foreign-born population and altering the nation’s birth patterns. Non-Hispanic whites will remain the largest racial or ethnic group in the overall population but will become less than a majority, the projections show. Currently 62% of the population, they will make up 46% of it in 2065. 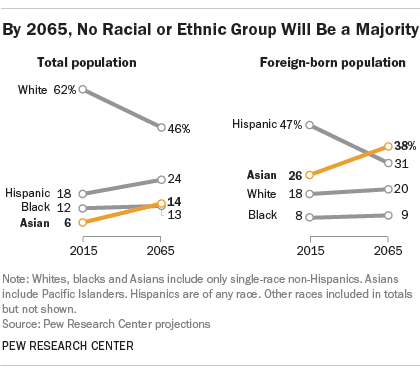 Hispanics will be 24% of the population (18% now), Asians will be 14% (6% now) and blacks will be 13% (12% now). The U.S. electorate already is more diverse than ever, and the projected demographic changes would produce a rising share of non-white potential voters. One important factor is the rising age of the second generation – people born in the U.S. to at least one immigrant parent. Currently, a large share is not yet eligible to vote. This group’s median age is 19, meaning half are younger and half are older. But by 2065, their median age will be 36, according to the new projections. The increased share of Asian immigrants among all immigrants means that education levels of the foreign-born population could rise sharply, because Asian immigrants tend to be better educated. Among recent immigrants from Asia, for example, 57% have completed college, compared with 13% for recent Mexican immigrants and 28% for immigrants from other Central or South American nations. The rise of the Asian share of the immigrant population also could have implications for the political debate about immigration over the next 50 years. Americans today have mixed views about the impact of immigrants on society, but tend to have more favorable views of Asian (and European) immigrants than other groups, according to a recent Pew Research survey. The survey also found that most Americans (56%) would prefer giving priority to immigrants who are highly educated (or highly skilled), compared with 37% who favor giving priority to those with family in the U.S. The poll also found that about half of Americans (49%) would like immigration levels decreased, and that is something that may happen anyway, according to the projections. Although immigrants are projected to be a record 18% of the population in 2065, the foreign-born population will be growing more slowly in 50 years than it has recently. From 2055 to 2065, the immigrant population is projected to rise by 9%, compared with 17% from 2005 to 2015 (which was markedly lower than the growth of more than 40% for each of the three preceding 10-year periods). The projections also show a change in birth patterns, with a continuing dip in average lifetime births to Hispanic women and a slight rise in average lifetime births to Asian and white women. Today, average lifetime births to Hispanic women are markedly higher than to other groups, but the projections show that in 2065, Hispanics, whites, blacks and Asians would have similar fertility rates. Overall, the U.S. fertility rate would be about the same as it is now, with the average woman having slightly less than two children. These trends reflect Census Bureau assumptions about birth patterns. The projections are based on assumptions about birth, death and immigration rates that are built on recent trends, but those trends can change. Moreover, any projections have built-in uncertainties, especially for years further in the future.